Here’s where you’ll discover the best buys for cheap frying pans anywhere in the UK. Do you just want a cheap frying pan? You know one where the handle comes loose, the base warps and food sticks in a brown mess on the so-called non-stick surface? 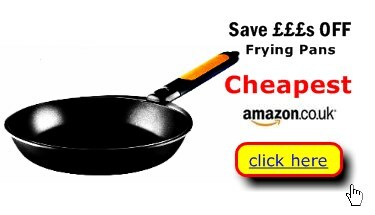 Or would you prefer the best frying pan at the cheapest price in Britain? At Best Buys Compared we research prices across a panel of British retailers – and NO Tesco and Argos aren’t always cheapest. Take these four cheap frying pans by way of illustration. Each is highly rated by their owners – scoring a near to a perfect 10. Yet you can pick them up for under £28 - perhaps less. And do take a moment to check out the Castey Vulcano page – it’s our best frying pan. The Vulcano is a useful cookware investment that will last a lifetime. It also works on any cooker including induction hobs. * Overall Users’ satisfaction Rating. How all users rated their experience of their pan model after 3 months of use. ** Using 24cm pans as example. Smaller pans will be cheaper, larger pans proportionally more. Guide price at the time of writing – could be lower now – check individual pans for the latest low prices. Even with just the top ten you may still like us to help you choose. That’s why we’ve compiled a “best buy for” page. There you will get the facts on what makes your best value choice of fry pans. By that we mean a durable cooking pan that offers value for money and is easy to clean. It’s also, a pan that will keep both its looks and non-stickiness for years to come. And of course a griddle pan that will turn out tasty results every time. Oh yes – and a pan that will work on whatever cooker or hob you have. Our unbiased service gives you the key facts in plain English, not marketing puff. That helps you locate top, cheap frying pans. It’s a service that will make your money go further. Check for the best price and best frying pan right here at Best Buys Compared. The Tefal Specifics 9.00/10 is an excellent example of a cheap frying pan that’s well-rated by its users. The Kitchen Craft Clearview is cheapest at £11 but as you can see an overall rating of 7.27/10 means there are some disgruntled owners. And then there’s the confusing “is that a bargain or not”. At £50 the Le Creuset Deep is highly rated by users 9.76/10. It will probably last you a lifetime and look v. smart in your kitchen. If you think skillets are more than just for fry ups – think sauces, omelettes and stir-frys - you might well think the Le Creuset is a bargain. On the other hand, if you after a bargain check out Tefal for a cheap frying pan. No less than 3 models made or user nominated top 10 frying pans. And they are best buys on Amazon too. At Best buys compared we offer a daily updated, UK-wide price research service. Consider any of the pans on display here. They are the user nominated top 10 in Britain. On our price research pages we display the top 3 cheapest prices. That means you – wise shopper – can nab a bargain with the best deal without wearing out show leather in a stuffy mall or soulless retail park. So, if you are after the best cheap frying pan at the lowest price you’re come to the right place. That’s right! At a click of the mouse or touch of the screen you can rustle up a pan, skillet or griddle for a comforting bubble and squeak, a tasty bacon sandwich, home-made sauce or healthy stir fry. Check out the top, user-rated, cheap frying pans today!